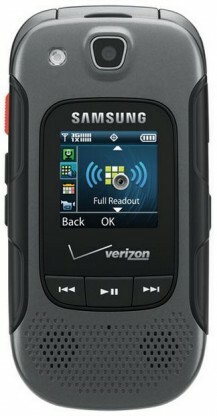 Verizon Wireless today made the Samsung Convoy 3 available for sale from its web site. The Convoy 3 is a rugged flip phone with push-to-talk services. The phone's main features include dual color displays, dual microphones for noise cancellation, and mil-spec rating for protection from shock, dust, vibration, heat, and moisture. The Convoy 3 also has a 3.2-megapixel camera with video capture, media playback and messaging apps, and a 480MHz processor. The device supports Verizon's 3G network, but not its LTE 4G network, and Bluetooth. It also supports microSD cards up to 32GB. The Convoy 3 costs $99 with a new two-year contract. It will reach Verizon's retail stores in the coming weeks. Samsung has published details about the Convoy 3 for Verizon Wireless. The Convoy 3 is a rugged flip phone that includes support for push-to-talk services. The phone's main features include dual color displays, dual microphones for noise cancellation, and mil-spec rating for protection from shock, dust, vibration, heat, and moisture. The Convoy 3 also has a 3.2-megapixel camera with video capture, media playback and messaging apps, and a 480MHz processor. The device supports Verizon's 3G network, but not its LTE 4G network, and Bluetooth. It also supports microSD cards up to 32GB. The Samsung Convoy 3 has not yet been announced by Verizon Wireless, nor added to its web site, where the Convoy 2 is still for sale.